Products manufactured by Savour Chocolatier of Veazie. 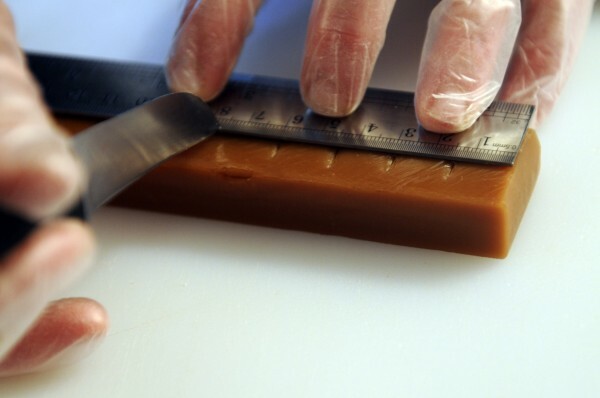 Kim Dagher of Savour Chocolatier measures the sections of taffy that she will soon cut. About two and a half years ago, Veazie resident Kim Dagher found herself in need of a new job. She mulled over all the career changes she could take, but eventually landed on a business plan suited to her sweet tooth — she’d learn to make artisan chocolates and start selling them in the Bangor area. She’s now entering her second holiday season as the main force behind Savour Chocolatiers, making 27 varieties of truffles, brittles, toffees, taffies and other chocolate-covered treats. Dagher spent a full year preparing to start her business, including taking online chocolate-making classes, and eventually spent several months studying at the Barry Callebaut Chocolate Academy in St. Hyacinthe, Canada, near Montreal. When she was ready to start making and selling in June 2011, she started with brittles, taffy, a handful of truffles, what she calls “Black Bear Paws,” and what’s become her most popular offering, Maine sea salt caramels. Dagher also makes a next-level version of a Needham, the New England potato, coconut and chocolate treat that has its roots in 19th century Maine. Needhams are still a staple of grandmother’s kitchens statewide, but Dagher has taken the humble ingredients needed to make the confection — instant mashed potatoes, dried, shredded coconut and basic chocolate — and replaced them with whipped Maine potatoes, real coconut and her signature Belgian dark chocolate. The end result is a Needham like nothing you’ve ever tasted. 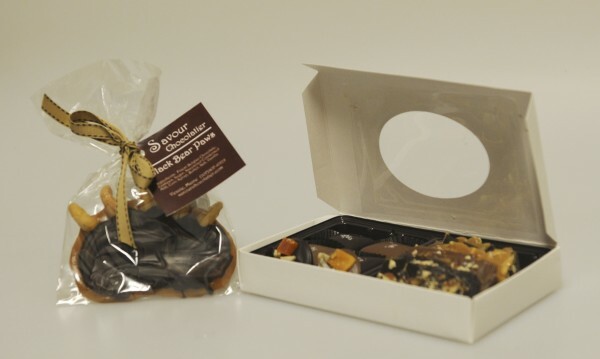 Savour Chocolatier products are available at Frank’s Bakery and Sweet Stuff at the Bangor Mall, Rebecca’s Gift Shop, Bangor Wine & Cheese Company, and Eastern Maine Medical Center’s gift shop, all in Bangor, at Cancer Care of Maine in Brewer, and online at savourchocolatier.com. Dagher will be at an open house this Friday at Rebecca’s, 43 Main St. in Bangor, showing off a variety of her products.